My 6th Wednesday Wishlist kali ini hue pengen boxed set seri Matched. 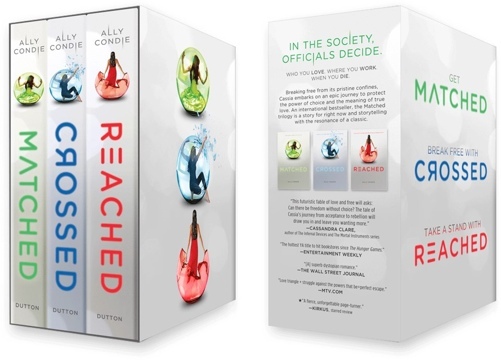 The complete collection of critically acclaimed, award-winning novels from New York Times-bestselling author Ally Condie’s Matched Trilogy, including Matched, Crossed, and a signed edition of the breathtaking conclusion, Reached. Kayaknya seru banget kalo bisa ngoleksi box set warna putih. Trilogi Matched juga bakal difilmkan. Info bisa diintip di sini. Yang mau ikutan Wishful Wednesday bisa klik blog Books To Share. Posted on January 23, 2013, in Uncategorized and tagged book, Meme, Wishful wednesday, wishlist. Bookmark the permalink. 1 Comment.